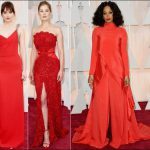 Shimmering, belted, red gowns were just some of the trends spotted at last night’s Oscars. What was your favorite? Did you have a favorite look at last night’s Golden Globes. We especially love Emma Stone’s style, which wasn’t a dress at all! It was all about the little black dress at the AMA’s last night. But of course, no two dresses were alike!